Drive is a racing game that is completely based on sound. Drive is one of the first racing games for the blind released for young visually impaired gamers. In Drive, players test a new experimental vehicle named “Shuttle”. This Shuttle is connected to a fixed track in the Cycom TestLab. In contrast to most racing games for the blind that aim at making racing accessible, the steering – which primarily is a visual activity – is excluded from gameplay. The developers of Drive have chosen to focus on the essence of racing games: the feeling of controlling a vehicle with tremendous velocity. The challenge in Drive is based on audio-dictated gameplay; the player is required to listen carefully and react to boosters. These boosters help the player to accellerate. The extra velocity caused by boosters is only temporarily, so clever players combine boosters to reach the highest speed levels. Various audio elements have been added to the game. During the ride co-pilot Bob will accompany the player. Various background sounds enhance the experience and the interactive music corresponds with the success of the player. 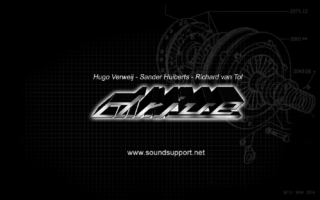 Drive also was a very early example of a game utilising real-time sythesis: the engine sound was generated during gameplay. Drive was seen on many (international) newssites, in several newspapers, featured at conferences and Dutch national television. It was even added to the Game On International game exhibition. Up to now, Drive has been played almost 150.000 times by blind and seeing players around the world.